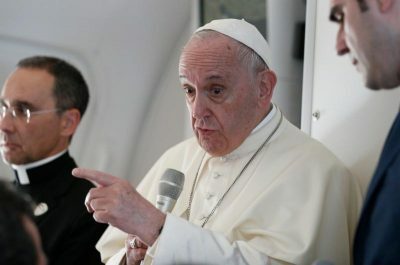 VATICAN CITY (CNS) — The leaders of three branches of the French religious Community of St. John insist their order has enacted strong protections against clerical sexual abuse, including the abuse of its nuns by its priests and brothers. The pope made his remarks Feb. 5 to reporters flying back to Rome with him from the United Arab Emirates. The group dissolved by Pope Benedict in January 2013, the order said, had left the main community and in 2012 formed the Institute of the Sisters of St. John and St. Dominic. In 2014, the Vatican allowed the women to form a new community in Spain — the Sisters of Mary, Morning Star — although it banned the former prior general of the Contemplative Sisters of St. John and three other members from involvement with the group. The statement from the French community acknowledged, as the order had done in 2013, that Dominican Father Marie-Dominique Philippe, founder of the community, “had committed acts contrary to chastity with several adult women whom he accompanied at the time,” including some of the consecrated sisters. Father Philippe died in 2006. “The government of the Brothers of St. John is committed to process every case of abuse in accordance with the directives of the Catholic Church and the civil law of the country where the act was committed,” it said.